When you had your vasectomy operation, a piece of the tube (vas) running up from each testicle was taken out. Ever since that time, your testicles have been making sperms, but your body has been melting the sperm away because they cannot pass along the vases. If the cut ends of the vas on each side can be joined up again, the sperm will pass along the vas once more and you may become fertile again. The chance of fathering more children is about 1 in 3. This depends on the size of the gap between the cut ends, the method of stitching the ends, and earlier infection or scarring. Even though the sperm tests after operation may be alright, this does not always mean that a pregnancy is a certainty. This is because the sperms may not be as strong as they used to be before the vasectomy. You will usually have a general anaesthetic, and will be asleep for the whole operation. A cut is made into each side of the scrotum. The vas on each side is found. The cut ends are trimmed and freshened and stitched together using plastic stitches that are finer than hair. The cuts in the skin are then closed up. After two to three hours on the ward, you should feel fit enough to go home. There are no real alternatives. 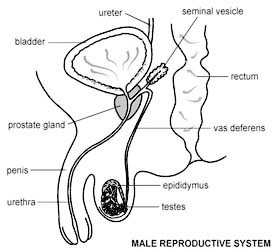 Drawing sperm from inside the testicle and using it to fertilise the female egg is worth thinking about if the vasectomy reversal fails. Although you will be conscious soon after the operation ends, you are unlikely to remember anything until you are back in your bed on the ward. Some patients feel a bit sick for a few hours after the operation, but this passes off. You will be given some treatment for sickness if necessary. You may be given oxygen from a face mask for a few hours if you have had chest problems in the past. You will have a dressing on the scrotum held on with elastic net pants. A general anaesthetic will make you slow, clumsy and forgetful for about 24 hours. The nurses will help you with everything you need until you are able to do things for yourself. Do not make important decisions, drive a car, use machinery, or even boil a kettle during this time. There is some discomfort on moving rather than severe pain. You will be given painkilling tablets to control this as required. Ask for more if the pain is not well controlled or if it gets worse. Make sure you are going home by car with your relative or friend. Once home, go to bed. Take painkiller tablets every six hours to control any pain. The next morning you should be able to get out of bed quite easily despite some discomfort. You will not do the wound any harm. The exercise is good for you. The second day after the operation, you should be able to spend most of your time out of bed in reasonable comfort. You should be able to walk 50 yards slowly. By the end of a week the wound should be nearly pain-free. It is important that you pass urine and empty your bladder within 6 to 12 hours of the operation. If you are experiencing difficulty in doing that, phone the hospital or your GP. Replace the dressing 24 hours after the operation. Hold it in place with Y-front or jockey underpants. Keep the wound dressed like this for a week. You can wash and bathe as often as you like but try to keep the wounds dry for five to seven days. Use ordinary water and soap. Salt water is not needed. After you leave hospital you may feel tired for a day or two after the operation but you will quickly get back to normal activities and exercise within a week. You can drive as soon as you can make an emergency stop without discomfort in the wound, i.e. after about seven days. You should be able to return to a light job after about one week, and any heavy job within four weeks. You can restart sexual relations within two or three weeks when the wound is comfortable enough, and remember you may be fertile straight away. The hospital will arrange sperm tests two months or so after your operation when you will be seen again. It is best to take contraceptive precautions from the time of the operation. At first, discomfort in the wound will prevent you from harming yourself by lifting things that are too heavy. After two weeks you should be able to lift as much as you used to lift before the operation.. There is no value in trying to speed the recovery of the wound by special exercises before the month is out. Complications are rare and seldom serious. If you think that all is not well, please phone the hospital or your GP. Bruising and swelling may be troublesome. Swelling may take four to six weeks to settle down. Infection is a rare problem and settles down with antibiotics in a week or two. Sometimes the stitches do not drop out in a week. Contact the hospital or your GP to have them removed. Aches and twinges may be felt in the wound for up to six months. In the first 24 hours, bleeding from the wound is the most important thing to look out for. A little blood staining on the dressing is normal. If bleeding comes through onto your underpants, phone the hospital. The same applies to any swelling under the skin bigger than 1 inch (2.5cm.). The bleeding is extremely rarely life-threatening, but if left untreated it can result in a big painful haematoma (blood clot) which can also get infected and might require another operation to fix the problem. Bleeding becomes a real problem mainly for patients who don’t follow the instructions for rest after the operation. . In the first week, if the wounds get painful, reddened, and swollen, there may be some infection, contact your GP. Very rarely, the vessels that provide the blood supply to the testis can be damaged during the operation and this can result in necrosis (dying) of the testis which requires another operation to remove it. Also very rarely patients feel some chronic pain (mild to moderate and sometimes severe) in the area of the operation. This is probably due to damage of the small nerves at the area of the operation or chronic irritation of the nerves from the scarred tissue in the area. Finally, some patients experience sexual problems after the operation. It is almost certain that the operation is not the cause of such problems. The cause is either psychological (feeling that after the operation things have to go well and result in a pregnancy soon) or more frequently they are problems that existed before the operation and for psychological reasons become more prominent after the experience/“trauma” of the operation. << Back to " Male reproductive System & Urinary Tract "